V. FOP NEWS: House Passes Blue Alert!!! National President Canterbury presided over the 34th Annual National Peace Officers' Memorial Service. President Barack H. Obama II was the key note speaker (see Item IV. below). Executive Director Jim Pasco met with Vice President Joseph R. Biden, Jr. at a breakfast reception to discuss law enforcement issues. National President Canterbury and Executive Director Pasco met with the new U.S. Attorney General, Loretta E. Lynch, to discuss current events and future cooperation. National President Canterbury, Executive Director Pasco, Vincent Canales, President of the Maryland State Lodge, and Gene Ryan, President of Baltimore Lodge #3, met with Vanita Gupta, Acting Assistant Attorney General for the Civil Rights Division at the U.S. Department of Justice (DOJ) and her staff to discuss impending investigation of the Baltimore Police Department. Executive Director Pasco met with Alejandro Mayorkas, Deputy Secretary of the U.S. Department of Homeland Security, about current developments in law enforcement. Senior Legislative Liaison Tim Richardson represented the FOP at a meeting hosted by the Asset Forfeiture and Money Laundering Section of the U.S. Department of Justice (DOJ) to discuss potential legislation reforming Federal asset forfeiture laws. Senior Legislative Liaison Richardson represented the FOP at a meeting with Senator Timothy E. Scott (R-SC) to dicuss the issue of Body Worn Cameras (BWC). The House considered and passed S. 665, the "Rafael Ramos and Wenjian Liu National Blue Alert Act," by voice vote. The measure now goes to the President for his signature (See Item V. below). H.R. 2146, the "Defending Public Safety Employees Retirement Act," allowing officers to make penalty-free withdrawals from governmental plans before the age of 50. The House also considered and passed H.R. 2048, the " Uniting and Strengthening America by Fulfilling Rights and Ensuring Effective Discipline Over Monitoring (USA FREEDOM) Act," on a 338-88 vote. The bill will now be transmitted to the Senate for further action. The Senate considered and confirmed Sally Quillian Yates to be the next Deputy Attorney General of the United States on a 84-12 vote. The Senate continued debate on legislation entitled the "Trade Promotion Authority Act," which would revise current Federal procedures when considering and approving trade deals with other nations. A. Support H.R. 973, the "Social Security Fairness Act"
We added 2 new cosponsors to H.R. 973, bringing our current total to 100. The Senate companion bill has not yet been reintroduced. B. Support the "Law Enforcement Officers' Equity Act"
This bill has not yet been introduced. Today the Fraternal Order of Police and its Auxiliary will gather on the West Front of the U.S. Capitol to honor 131 law enforcement officers who gave their lives in the line of duty, including 117 of which were killed in 2014. The National Peace Officers Memorial Service is the capstone event of National Police Week. One week each year, our nation pauses to recognize the extraordinary dedication and service of our local, State, tribal, and Federal law enforcement officers, Canterbury said. National Peace Officers Memorial Day is the day that we honor the memory of those officers who lost their lives in the line of duty and grieve with the loved ones they have left behind. The sacrifices of these heroes and their families help all of us to make and renew our commitment to protect and serve our communities and our nation. During National Police Week, thousands of law enforcement officers in every region of the nation gather at memorial services to honor their fallen colleagues. More than 20,000 officers, as well as the surviving family members and friends of slain officers, have traveled to the nation s capital to attend the 34 th Annual National Peace Officers Memorial Service, which is the nation s largest and most prominent memorial service held on behalf of fallen law enforcement officers. In October 1962, President John F. Kennedy signed a proclamation designating May 15 th as National Peace Officers Memorial Day. Since the signing of this proclamation, this date has been the official day of recognition for law enforcement officers who have lost their lives in the performance of their duty. This is the 34 th year that the Fraternal Order of Police and its Auxiliary have held the National Peace Officers Memorial Service. Chuck Canterbury, National President of the Fraternal Order of Police, applauded news that the House passed S. 665, the "Rafael Ramos and Wenjian Liu National Blue Alert Act." three other measures of legislation important to law enforcement, under suspension of the rules. "The National Blue Alert Act is a key piece of the FOP's Officer Safety Agenda," Canterbury said. "Immediately after it was favorably passed by the Senate we began working with House offices to get the bill to the floor and pass it. Today, we saw the success of that effort." The legislation would provide for local, regional, and national dissemination of time sensitive information that would help apprehend a suspect accused of killing, kidnapping, seriously wounding, or who may pose an imminent and credible threat to a law enforcement officer. "The FOP is grateful for the authors of the House companion bill, Representative David G. Reichert, a former sheriff, and Representative William J. Pascrell," said Canterbury. "The FOP is especially grateful for Senator Leahy, whose dogged efforts played a critical role in getting this bill through the Senate, ultimately leading to its passage in the House today." The "Rafael Ramos and Wenjian Liu National Blue Alert Act," now goes to President Obama, who is expected to sign the bills into law. Three additional measures were considered and passed by the House: H.R. 723, the "Fallen Heroes Flag Act," which provides a Capitol-flown flag to the immediate families of law enforcement officers who are killed in the line of duty; H.R. 606, the "Don't Tax Our Fallen Public Safety Heroes Act," amending the Internal Revenue Code of 1986 to exclude compensation received by officers and their dependents from gross income; and H.R. 2146, the "Defending Public Safety Employees Retirement Act," allowing officers to make penalty-free withdrawals from governmental plans before the age of 50. These three bills will now be transmitted to the Senate for further action. VII. Follow the FOP National Legislative Office on Twitter! V. DAY ON THE HILL 2015!!! Executive Director Jim Pasco spoke with officials at the U.S. Department of Justice (DOJ) and key members of the Senate Committee on Appropriations about S. Amdt. 67 offered by Senator Daniel S. Sullivan (R-AK) to S 1., the "Keystone XL Pipeline Act." The amendment, which the FOP strongly opposed, would have stripped law enforcement officers employed by the Environmental Protection Agency (EPA) of their authority to carry firearms. The amendment was not considered and was rendered moot after cloture was invoked on the underlying bill. Executive Director Pasco discussed law enforcement views and concerns with the issue of Internet gaming with officials at the DOJ. Executive Director Pasco responded to numerous media inquiries with respect to the activities of the President's Task Force on 21st Century Policing and the officer safety implications of the application Waze. Senior Legislative Liaison Tim Richardson and Legislative Liaison Marie Carchedi participated in a conference call with other law enforcement and stakeholder groups regarding legislation to combat human trafficking. Both the House and the Senate were in session this week, although the House went into recess on Wednesday afternoon to allow for the annual Democratic retreat. The House considered and passed H.R. 246 on a 411-0 vote. The bill, which goes to the Senate for further consideration, amends the Missing and Exploited Children Act to expand the definition of "child prostitution" to include trafficking and exploitation. The House considered and passed H.R. 469, the "Strengthening Child Welfare Response to Trafficking Act," on a 410-0 vote. The bill, which now goes to th Senate for further action, expands the eligibility of certain grant programs under the Child Abuse Prevention and Treatment Act. The Senate considered a number of amendments to S. 1, the "Keystone XL Pipeline Act," and then passed that legislation on a 62-36 vote. The bill will now go to the House or a conference committee for further action. The Committee on the Judiciary held two hearings on the nomination of U.S. Attorney Loretta E. Lynch to be the next Attorney General of the United States. A. Support the "Law Enforcement Officers' Equity Act"
B. Support the "Social Security Fairness Act"
Chuck Canterbury, National President of the Fraternal Order of Police, expressed frustration with news that the final rule adopted by the Federal Communications Commission (FCC) failed to require cellular telephone companies to improve indoor wireless location accuracy. The technology exists and its use would have greatly improved the ability of law enforcement and other public safety officers to locate cell calls made indoors, Canterbury explained. The blended indoor-outdoor standard that appears in the final rule is a huge loophole for the carriers. While the text of the final rule is not yet available, information from the FCC indicates that it lacks a provision the FOP supported that would have required location accuracy requirements on cellular calls to within fifty meters horizontally and three meters vertically. This requirement is of particular importance in urban areas with large numbers of multistory buildings. The location accuracy requirements would have reduced response times to emergency calls and increased the safety of law enforcement and other public safety officers executing searches in hazardous environments, Canterbury said. The FCC really missed the mark here and did public safety a grave disservice. V. FOP NEWS: DAY ON THE HILL 2015!!! Your participation in this year's Day on the Hill is of critical importance as our profession is in crisis. The FOP is ready to wage an intense campaign to get the attention of the Administration and Congress and to focus their attention on OUR issues and OUR safety. We need you to help make sure our voice is heard! WE NEED YOUR PARTICIPATION AT DAY ON THE HILL!!! The FOP Day on The Hill 2015 will begin on Monday, 9 February 2015. The National Legislative Office and the National Legislative Committee will host a short briefing on our legislative agenda. The briefing will take place at 3pm on Monday afternoon at D.C. Lodge #1 and last approximately one hour. Tuesday and Wednesday, 10-11 February, will be devoted to your meetings with Members from your home States and districts. These appointments should be made in advance!!! Event participants should make every effort to have their Representative or Senator attend the meeting along with the appropriate staff person. VI. Follow the FOP National Legislative Office on Twitter! The CC265 Conference Room occupies one of the busiest corners on the Inver Hills Community College campus. Located next to Student Services in the College Center, the conference room is an important gathering place for students. On Dec. 2, 2014, CC265 was renamed the Fraternal Order of Police Minnesota Lodge 1 Conference Room to recognize the organization’s community involvement and charitable works. Tim Wynes, J.D., IHCC president, spoke at the naming ceremony, welcoming Mike Norstrem, FOP president, Patrick Sloan, FOP 1st vice president, Randy Dalbec, FOP treasurer, and Dan Athmann, an instructor in the college’s Law Enforcement program. Sloan and Dalbec are also IHCC alumni. Wynes thanked Minnesota FOP Lodge 1 on behalf of Inver Hills staff, faculty, students and the IHCC Foundation Board of Directors as well as the community members the college serves. Wynes spotlighted the collaborative work FOP MN Lodge 1 has accomplished with numerous community partners, including school programs, food shelves and the Boy Scouts. Through the partnership with Inver Hills, FOP MN Lodge 1 has donated $90,000 in pledges and gifts to support scholarship and tuition assistance programs for students pursuing A.S. degrees in Law Enforcement, Criminal Justice and Emergency Medical Services. In August 2015, the National Fraternal Order of Police will conduct its 62nd National Conference and Exposition at the David L. Lawrence Convention Center in Pittsburgh, PA, where we were founded. Hosted by the Pennsylvania State Lodge, this event represents one hundred years of professional law enforcement experience for the largest and oldest law enforcement labor organization in the United States. We anticipate a large gathering to celebrate our 100th Anniversary. Executive Director Jim Pasco spoke with Lawrence E. Strickling, Assistant Secretary for Communications and Information at the U.S. Department of Commerce, regarding impending vacancies on the First Responder Network Authority (FirstNet) Advisory Board. Legislative Liaison Marie Carchedi represented the FOP at a monthly meeting of other law enforcement and criminal justice groups to hear from staff in the office of U.S. Senator Cory A. Booker (D-NJ). The House considered, amended and passed H.R. 4757, the "Transportation, Housing and Urban Development, and Related Agencies Appropriations Act, 2015," on a 229-192 vote. The House debated amendments to H.R. 4800, the "Agriculture, Rural Development, Food and Drug Administration, and Related Agencies Appropriations Act, 2015," but did not hold a final vote on passage. The Committee on Appropriations considered, amended and favorably reported draft legislation funding the U.S. Department of Homeland Security. The bill goes to the floor for further consideration. The Committee on the Judiciary held an oversight hearing on the Federal Bureau of Investigation (FBI). The Senate considered, amended and passed H.R. 3230, the "Pay Our Guard and Reserve Act," on a 93-3 vote. The bill, which makes necessary reforms to the U.S. Department of Veterans Affairs, now goes to the House for further action. The Committee on the Judiciary held an oversight hearing on the U.S. Department of Homeland Security. We added one new cosponsor to H.R. 1362, bringing our current total to 26. B. Support H.R. 1795/S. 896, the "Social Security Fairness Act"
We have118 cosponsors on H.R. 1795. We have 18 cosponsors on S. 896. The FOP is engaged in an effort to incorporate language into the Defense reauthorization bills. IV. Follow the FOP National Legislative Office on Twitter! 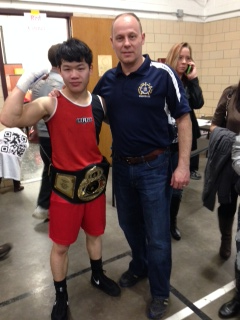 Lodge One President Norstrem presented a champions belt to Nahtxu Vang of Rice Street Region II club. He defeated Carlos Lopez in the event. Region II Golden Gloves is celebrating its Diamond Anniversary , 75 years in introducing young men to boxing. Lodge 1 is a proud sponsor of Golden Gloves through our charitable gaming. Event took place March 29, 2014 at WSP Armory. Engility is seeking experienced Police Advisors to deploy to multiple locations worldwide. Spanish, Russian, French speakers or the ability to speak other languages is desired. 2. Locate the tab at the top of the page and click on the “Careers” tab. Executive Director Jim Pasco spoke with Alejandro Mayorkas, Deputy Secretary for the U.S. Department of Homeland Security, about the Department's law enforcement priorities. Executive Director Pasco spoke with Brian de Vallance, Acting Assistant Secretary of the Office of Legislative Affairs with the U.S. Department of Homeland Security about immigration issues. Executive Director Pasco spoke with Michele M. Leonhart, Administrator of the Drug Enforcement Administration, about legalization issues. Executive Director Pasco spoke with R. Gil Kerlikowske, Director of the Office of National Drug Control Policy and the nominee to be the next Commissioner for U.S. Customs and Border Patrol, about legalization and customs enforcement issues. Executive Director Pasco and Senior Legislative Liaison Tim Richardson met with Ronald L. Davis, the new Director for the Office of Community Oriented Policing Services (COPS), as well as his top staff. Executive Director Pasco spoke with Edward Pagano, Deputy Assistant to the President for Legislative Affairs (Senate), regarding executive nominations. Pagano is a long-time friend of the FOP and will be leaving the White House for the private sector. He will be greatly missed. Executive Director Pasco spoke with Lise Clavel, Special Assistant to the President and Assistant to the Vice President for Intergovernmental Affairs, Public Engagement, and Correspondence, regarding current nominations, immigration reform, prison overcrowding, mandatory minimum sentences and pending appropriations bills. Legislative Liaison Marie Carchedi met with staff in the offices of Senators Dean A. Heller (R-NV) and Robert P. Corker, Jr. (R-TN) to discuss H.R. 180/S. 357, the "National Blue Alert Act," and S. 933, the "Bulletproof Vest Partnership Grant Reauthorization Act." Legislative Liaison Carchedi represented the FOP at the Take 25 Partner Appreciation event held at the headquarters for the National Center for Missing and Exploited Children. Both the House and the Senate were in session for part of this week. The House considered and passed H.R. 2642, the "Federal Agriculture Reform and Risk Management Act," on a 251-166 vote. The "farm bill" now goes to the Senate for further action. The Senate considered and passed S. 1926, a bill making changes to flood insurance, on a 67-32 vote. The measure will now be transmitted to the House for further action. The Committee on the Judiciary held an oversight hearing on the U.S. Department of Justice. U.S. Attorney General Eric H. Holder, Jr. testified. The Committee on the Judiciary considered, amended and favorably reported S. 1410, the "Smarter Sentencing Act," on a 13-5 vote. The bill, which the FOP is evaluating, is now pending before the full Senate. We have 20 cosponsors on H.R. 1362. We have 109 cosponsors on H.R. 1795. We have 16 cosponsors on S. 896. There is no actively pending legislation addressing this objective. IV. FOP NEWS: DAY ON THE HILL 2014!!! BOOK YOUR ROOM NOW -- CUT-OFF DATE IS TODAY! The FOP Day on The Hill 2014 will begin on Monday, 10 February 2014. The National Legislative Office and the National Legislative Committee will host a short briefing on our legislative agenda. The briefing will take place on Monday afternoon at D.C. Lodge #1 and last approximately one hour. Tuesday and Wednesday, 11-12 February, will be devoted to your meetings with Members from your home States and districts. These appointments should be made in advance!!! Event participants should make every effort to have their Representative or Senator attend the meeting along with the appropriate staff person. Orders, production, and delivery will take place throughout the period with multiple production runs as minimum order quantities are met. Cards will be charged when minimum production quantities are met and an order for production is placed. Firearms will ship approximately 60 days later. A recent policy change by the National Football League (NFL) prohibits any person from carrying a concealed firearm within any NFL facilitiyundefinedincluding offices, stadiums and practice facilities. Only law enforcement officers and other security personnel employed by the team of stadium will be permitted to carry firearms. It is our understandings that many of the stadiums had similar policies in place for some time, but this season the prohibition is in effect for the entire league and all of its venues. This prohibition includes any person with a valid, State issued concealed carry permit (CCW) as well as active and retired law enforcement officers whose carriage of a concealed firearm would otherwise be legal under the Law Enforcement Officers' Safety Act (LEOSA). Members of the FOP have expressed their anger and, now that they must disarm, concern for their personal safety while attending football games. While the leadership of the FOP is engaged with the corporate leadership of the NFL to convey these views, we do reject any call for FOP members to call for a boycott of the NFL. You can read National President Canterbury's letter to NFL Commissioner Roger S. Goodell here. Boycotts are historically ineffectiveundefinedin fact, they often result in having the opposite of the effect intended. Considering the size, popularity and success of the NFL, it is highly doubtful that we would make a dent in their revenue stream. Secondly, FOP members work these games at these venues. Active duty officers, who are often paid overtime, provide security, traffic and crowd control and patrol the streets and parking lots around the venue. Retired law enforcement officers are also employed at stadiums across the country to provide security and other services for teams and the venues at which they play. It is a variance with common sense to boycott a business that provides employment for our members. It should also be noted that the LEOSA, when enacted in 2004, specifically permits a property owner to disallow firearms on his or her property. The FOP strongly supports the Second Amendment rights of all Americans and the exemptions provided by the LEOSA. However, the right of a property owner to decide who or what is permitted on his or her private property is equally sacrosanct. There are many individuals and businesses who, for whatever reason, do not allow firearms on their property. They have this right. The FOP will continue to work with the NFL leadership to address this issue and mitigate any negative effect it may have on our membership. In addition, we call upon our State and local lodges in the 32 NFL cities to reach out to team owners, venue owners, and local businesses to share the concerns of FOP members with respect to the new NFL policy. Our perspective on this issue has merit and we are much better off engaging cooperatively with the NFL than we are engaging in useless gestures like a boycott.